How Do Lawn Fertilizers Work? You know that lawn fertilizers work but do you know why? Like all chemical fertilizers, lawn fertilizers work by reintroducing essential elements to the soil that have been depleted by repeated use for lawns. By returning the chemical elements necessary for plant growth, such as potassium, nitrogen potash and phosphates, lawn fertilizers work to keep lawns healthy and to present that lush, green color that people love to see. Lawn fertilizers are popular because they work fairly quickly, are easy to obtain and are generally simple to apply. Packaged according to specific application needs, purchasing lawn fertilizers simplifies the life of homeowners and professional landscapers alike. 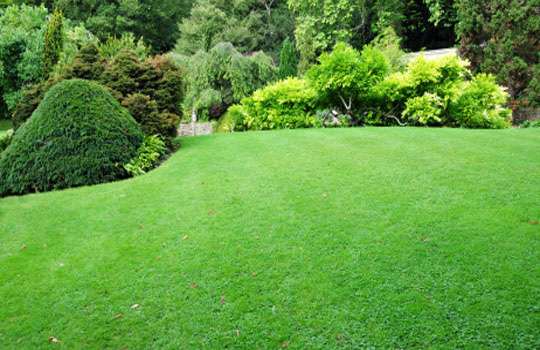 Lawn fertilizers, like other chemical fertilizers, can be easily over applied. When they are, they can burn grasses and make the soil less productive than before they were applied. Lawn fertilizers can also result in chemical runoff into adjacent water supplies, particularly those adjacent to large commercially treated areas. Because they are a chemical product, lawn fertilizers have the same negative impacts on the environment and on humans as all commercial fertilizers. What Are Lawn Fertilizer Boosters? Lawn fertilizer boosters, such as BioWash, are formulated to increase the effectiveness of lawn fertilizers. They do this by helping lawn grasses more efficiently absorb and process the nutrients made available by the fertilizers. In this way, fertilizer boosters help minimize the amount of fertilizer needed to achieve similar or even improved growth results. As a lawn fertilizer booster, BioWash has been proven to dramatically improve the growth rate and health of lawns. It does this by helping the roots more efficiently absorb the nutrients and moisture available from the soil. Through this efficiency, less lawn fertilizer is required, minimizing the risk of over application. Unlike chemical fertilizers, BioWash is a natural, 100% biodegradable product. It adds no harmful chemicals to the environment and is totally safe to users. Inexpensive to apply, demonstrated results and safe for people and the environment. A win-win combination!